With the undying legacy of MTV’s glory days in mind, and to spark the artistic spirit among the Filipino youth, Res|Toe|Run, the country’s premier shoe store that has a unique concept of a “restaurant,” held the first-ever Music Kicks Feeture Film Competition which culminated yesterday at the Trinoma Mall Activity Center. Participating schools were provided an official track, and were tasked to create a 3-4-minute video highlighting any of the RES|TOE|RUN shoe brands: DC, Fitflop, Kickers, Sanuk, Ellesse, Boxfresh, Shulong, Quicksilver, Roxy, Columbia, Lotto, Keen, Free Fish, Salvatos, KruZin, PeopleSwalk, Swims, Bedroom Athletics, Marie Claire, Swyt, Seavees, Desigual, Sledgers, Boxfresh, Tretorn, Supra, Sorel, Salomon and Flipsters. Top colleges and universities such as the University of the Philippines, De La Salle University, Colegio de San Juan de Letran, De La Salle-College of St. Benilde, Southville International School and Colleges, Far Eastern University, Asia Pacific College, University of Santo Tomas, and Assumption College, each had their artistic ambassadors to represent their school. 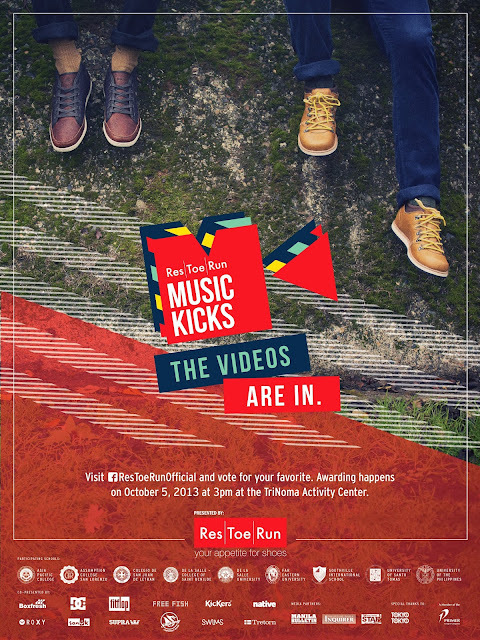 Aside from an online voting via RES|TOE|RUN's Facebook page, each of the entries were also graded by esteemed professionals in the field of creative advertising, television, and film. The panel consisted of: Mr. Raoul Floresca, AVP for Marketing Services Division, Primer Group of Companies, Ms. Joy Austria, Res|Toe|Run Brand Manager, Mr. Sid Maderazo, TV Commercials Director and Post Production partner at 88storey Films / Central Digital Lab, and Mr. Steve Vesagas, Chief Operating Officer, Revolucion Media Group and Producer of the critically-acclaimed movie, On The Job. During the event, Monster Radio’s DJ Alven and Ysa hosted the musical affair wherein attendees enjoyed different performances which fused three dance acts of Hip-hop, contemporary, and parkour as presented by the Halili Cruz School of Ballet, the UP Street Dance, and the Philippine Parkour/Free Running Association. Beatbox Acapella and the Nameless Heroes also performed their unique type of music during the event. After which, guests got to enjoy numerous side activities and booth displays that style aesthetes and artsy young ones surely enjoyed. The top three winners were announced and received each of their corresponding prizes of P100,000 for the grand prize winner - Asia Pacific University, P70,000 for the second placer - De La Salle College of St. Benilde, and P50,000 for the third placer - De La Salle University. Both student-representatives and their schools received cash and gift certificate awards. Teaser vid from grand prize winner Asia Pacific University! Congrats! Res|Toe|Run is owned and operated by The Primer Group of Companies, Asia's next retail giant. For more info and updates, visit Res|Toe|Run on Facebook.